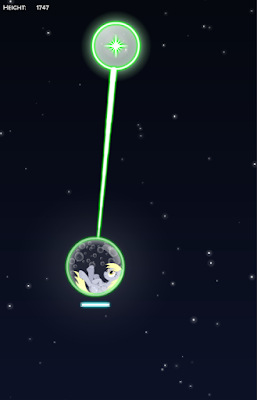 Starting off our little gem hunt, we have Bubbles , a rather neat little vertical scroller from the ever-prolific futzi01. Overall, the game's pretty much as simple as it looks: keep Derpy moving up for as long as possible by clicking and holding onto the bubbles that come down, which also keeps her personal bubble's health meter filled. Once that meter runs out, the bubble pops and, naturally, it's game over! I have to admit, for such a simple game I actually got quite a bit more replayability out of it than I expected! I spent somewhere around the better part of way too long zoning out and playing this game, and I don't know whether or not that's because of the somewhat addicting nature of the gameplay itself or that dope Dynamite Grizzly track keeping me around just to listen to it. Regardless of what's keeping me around the most, this game is definitely fun and well worth sinking some time into if you're looking for something chill to play. Next up on our list today is AJ's Truck by RenaissanceBrony, a simple little technicolor sidescroller with an equally simple story: there's a party going on, and you'll have to take that ridiculous old toy truck (wow, remember that ?) 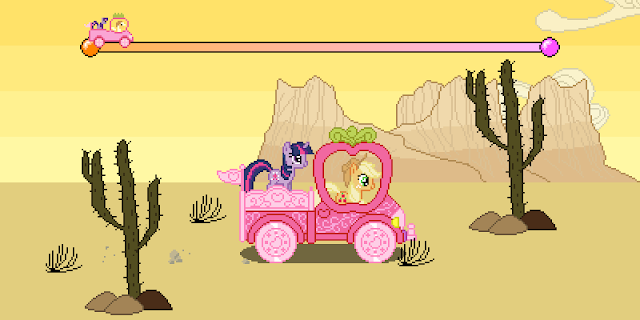 to get Twilight and Applejack there on time! Be careful of the rocks and cacti along the way though, or you'll regret it! I've overused the word "simple" at this point, but it really is the best adjective here! 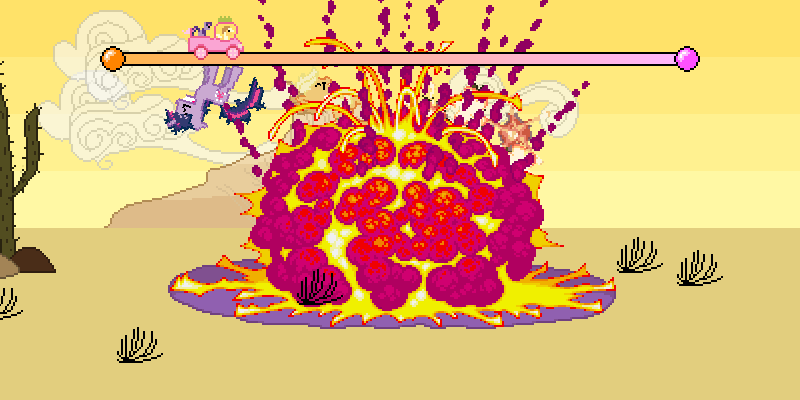 While there's not a whole lot going on gameplay-wise, what actually makes it notable to me is the nice chiptune soundtrack, the fact that the truck actually had pixel art made of it and there's a game essentially dedicated to it, and the fact that it has the best, most ridiculous death animation I've ever seen for a technicolor horse flash game. Seriously, if that doesn't sell you on this game, I don't know what will! Rounding things out here for now is empalu's RD Flying , a very chill and very visually appealing game that is quite literally exactly what it says on the tin. 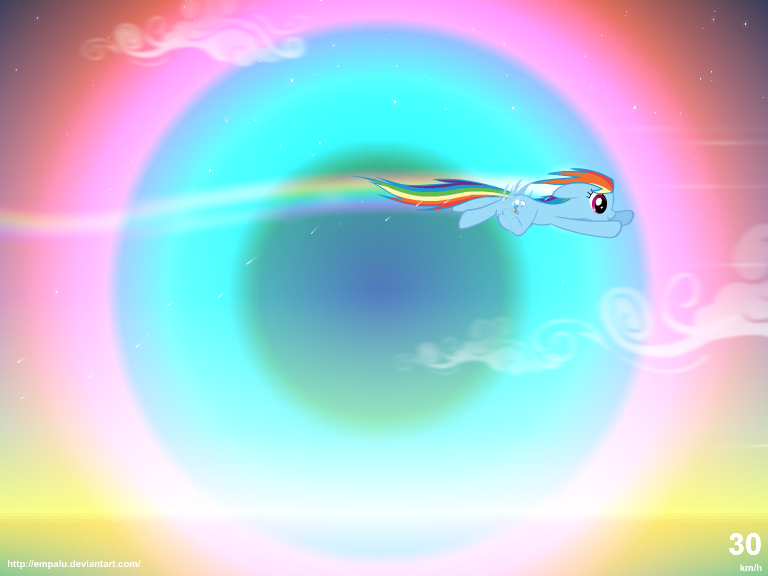 To the backing of a perhaps-ever-so-slightly-too-loud instrumental, you're in control of Rainbow Dash as you perform as many loop-de-loops, barrel rolls and dives as your heart desires. If you manage to get a handle on accelerating (which can take a bit to do! ), you can even manage to perform a Sonic Rainboom! Admittedly, it's not the most intensive of gaming experiences, but much like Bubbles above, it definitely ranks up there as a chill and even pretty relaxing experience! That's about it for the moment! I do hope y'all give these neat little minigames a go, and if you know of any games that we've passed up that you think deserve a mention here, please do let us know!